Vimo is the BEST way to make your video FUN and UNIQUE !! 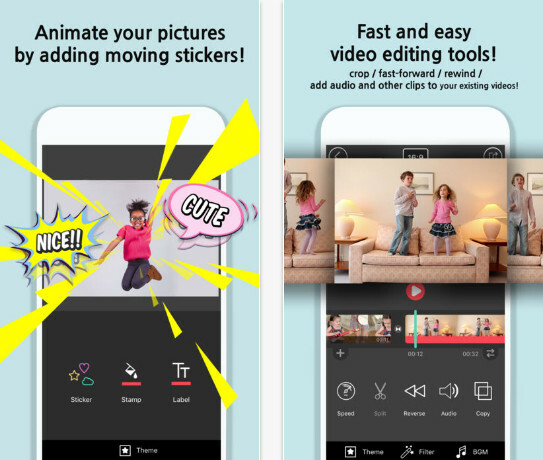 Using Vimo’s Motion Sticker(Stamp), you can change any of your videos into FUN and EXCITING ones ! Vimo’s Motions Stickers(Stamps) are animation clips with 50~100 frames and they play along with your video like GIF. * Vimo is universal – supports both iPhone and iPad with iOS 8 or later and optimized for iPhone 6 and iPhone 6+. Stickers(Stamps) with animation of 50 ~ 100 frames. It’s smooth and easily harmonize with your video. Since these are created as a vector shape, zooming the motion stickers(stamps) does not degrade the quality. * Add Animating Text Label over your Video. You can also add your own text label with animating decorations to your video. Vimo records and do the chores automatically. Share your videos to Youtube, Vimeo, Facebook, Instagram and others.